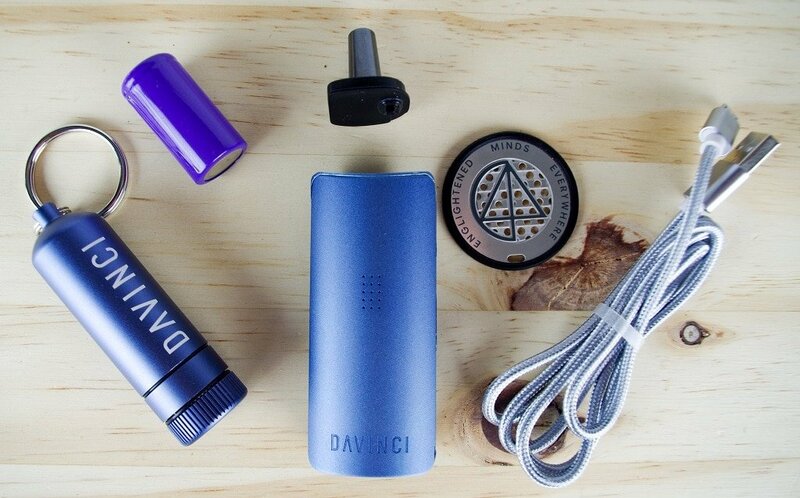 The Davinci Miqro is a dry herb conduction vaporizer made by the company Davinci. This is the fourth portable vaporizer released by the company with the first being the OG Davinci back in 2012. 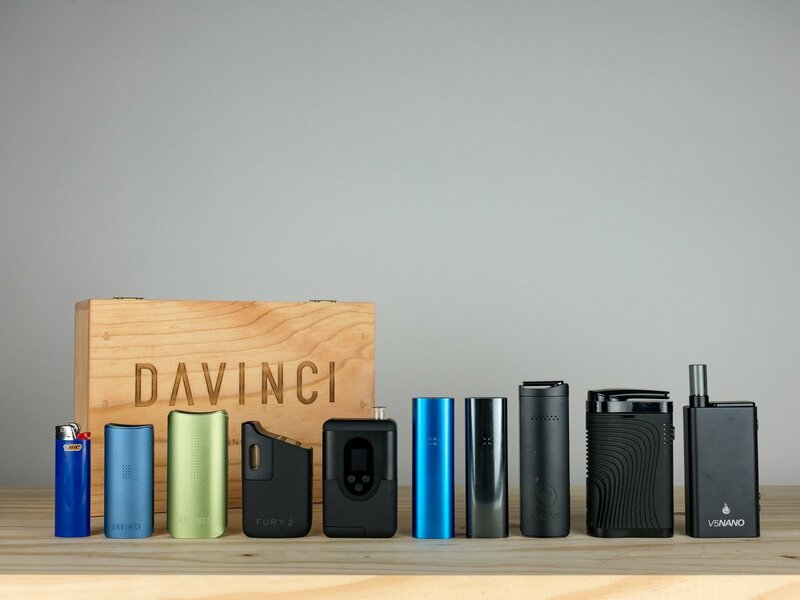 The complete Davinci vaporizer line up is the OG Davinci (March 2012), the Davinci Ascent (August 2013), the Davinci IQ (October 2016) and the reason you’re here, the Davinci Miqro (July 2018!). The OG Davinci is still for sale to this day on their website. The Miqro is going to be priced as a unit only for $149 and with a bunch of accessories as the explorers collection for $199. I have only had this unit for around a week so far, but I have managed to vape about an ounce of dry herb through it already. I will be sure to continue updating this review as I keep the stress tests going. While I wasn’t the biggest fan of the Ascent, I feel like Davinci really stepped up their game with the IQ and I’m a big fan of the Miqro. With the Micro, you get a full temp spectrum + smart paths, replaceable battery system, and the new pearl design actually works well to shrink chamber size for those single person sessions. The Miqro is easier to clean and maintain compared to the IQ. The new design allows for easy cleaning of all pieces and the pick tool is clutch for cleaning out the chamber after sessions. The Miqro is definitely the smallest battery powered portable vaporizer I have reviewed to date. I’m blown away by the size, design and overall functionality. Although I really like this unit, I do have a few minor gripes. The first being the outer shell gets hot like IQ. The manual does state that the “Explorers Collection” should include a glove but I didn’t get one with my package. Second, the battery is a small 18350, so overall life is only a bit above 30 minutes which means you’re only getting about six, five-minute sessions per battery. You do get two batteries for 60 minutes total. 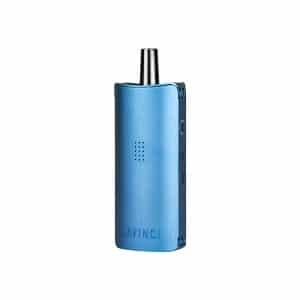 In short, the Miqro is perfect for someone vaping alone or in a group, needs portability/discretion and doesn’t need the most battery life. This is not the vaporizer to sit around at home having long casual sessions all day. This is the vaporizer to take to a festival, night on the town or walking the dog. You can easily hide the unit in your palm and it’s about like putting a key fob in your pocket. The size, price, and warranty are the real winners here. 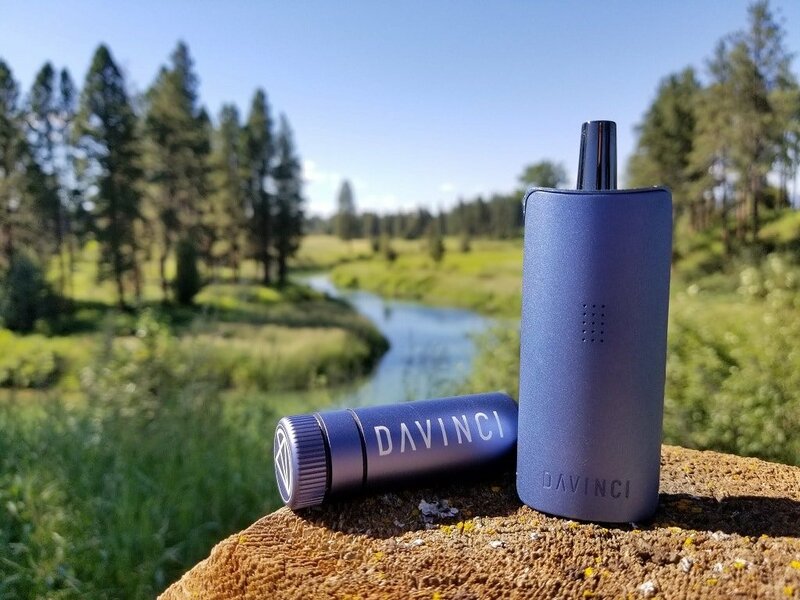 Now if you absolutely need the battery life, I recommend checking out the Davinci IQ. The IQ offers more features via the Davinci smartphone app, over double the battery life with each battery and I feel like the heater is stronger. I notice it is harder to overpower the IQ with an aggressive draw. The Miqro is now for sale and you can pick one up directly from Davinci here. Read on below to get my full Miqro vaporizer review. Size and Portability – The Miqro vaporizer weighs roughly 104 grams with the battery in and a full chamber. The Exact dimensions of the Miqro are 3 1/8 inches tall by 1 3/8 inches wide and roughly an inch deep. This unit is not only extremely small, but also packed full of great features. It’s easy to pocket, easy to conceal and you can completely palm it for discretion. It’s honestly so small that I’ve misplaced it a couple times already. It’s about the size of a key fob so if you lose your keys, you might misplace this guy. Build Quality – So far the Micro vaporizer seems very durable. I’ve had a few minor drops with no issues and the materials feel high quality and strong. I will continue abusing it hard outdoors and will report back with any weaknesses I manage to find. The unit feels good in the hands as far as size goes but it does get hot similar to the IQ. I’ve found that it helps to hold the device in your hand and let your palm dissipate some of the heat. I tend to notice it getting the hottest when I turn it on, set it down, and then forget about it. The Manual does state that it comes with a glove but I didn’t receive one with it. I have an email out to them with a couple questions and will report back when I hear from them. Lastly, the Miqro vape comes with a five-year manufacturer warranty which is one of the best in the price range. So far the Explorers collections seems very worthwhile to me. I have been really liking the carry can which has two different sections, the front end holds your spare battery, and the back end holds your extra dry herbs. The carry can also has watertight gaskets which I like. I also like the padded davinci carry case which has sealed zippers to help lock in smell, and should help prevent water from getting in. Extra Accessories – If you do plan to be using this device heavily an external charger like a nitecore and an extra battery or two might be a wise choice. This way you can be charging two batteries at one time. Heating: The Miqro heats up in roughly 40-50 seconds which is about average for today’s vaporizers. Some other portables like the Pax 3 are in the 20-25 second range so it all depends on when and where you’ll be using your vaporizer. I have noticed that the heater in the Miqro is not as strong as the IQ. I find myself using the higher temps a more on the Miqro especially when if I am wanting to exhale some clouds. With the IQ I basically never stirred the bowl, with the miqro sometimes I do towards the end of the session. Vapor Path: The vapor path in the Miqro is Ceramic Zirconium. The pearl, the bowl, the air path, and the mouthpiece all use this material. It’s easy to clean (much easier than the IQ) and provides a great taste for a conduction vaporizer. Temp Options: The Davinci Miqro features a full temp spectrum ranging from 300F-430F, smart path technology, boost mode and standby mode. Smart Path Technology: This mode allows you to pick a smart path labeled 1-4. Each path has a set temp range with an increment of 20 degrees. The unit will start at the low end of the spectrum and gradually increase the temp to the high end of the spectrum over the 5-minute session. Below are the temp ranges for each smart path. I’ve been using smart path 2 the most for flavor, and 3 and 4 the most for effect. Boost Mode: The Miqro Boost Mode will rapidly increase the device to max temp and hold it there while you keep the button pressed. Chamber Info (Bowl Size) – I’ve been able to get roughly .25 grams of dry herb in the chamber with a tight pack. I prefer to stick to around .15 grams and use the pearl to take up some of the chamber space.A tight pack will more likely require stirring but you’ll also get more clouds this way. A fine grind will also produce more clouds but will increase how often you’ll need to clean the device. Draw Resistance – In my testing I’ve found that when the Miqro is clean it has less draw resistance than pretty much every other portable in this price range. You will notice an increase in draw resistance once you get passed the 5 bowl range and I recommend cleaning all pieces after about 6-10 bowls to get the best results. A lot of this depends on the herbs you are using, your loading styles and if you clean out the chamber regularly after sessions. Leaving herbs in the chamber will cause it to get dirty quicker. Battery Specs – The Miqro uses a rechargeable 18350 900mah battery and you get two. At least I know you get two in the “Explorers Collection” version. I’ll update this for sure when I know what the “Unit Only” version comes with. Battery Life – So far I’ve been averaging about 30 minutes of use per full battery. Like I mentioned above, this is not going to be the vaporizer for someone who enjoys long sessions at home regularly. This IS the perfect vaporizer for those times you need discretion or when you just don’t want to carry a bulky unit. Charging Times – The Miqro has been charging a dead battery within the unit in about 90-110 minutes. I’ve been testing charging times on my external charger and so far it’s about 10-20 minutes faster. Not a huge deal but at least you can charge two at a time without needing the unit. The Zirconium Pearl, vapor path, and mouthpiece are easy to remove and clean. Generally I give the pearl a wipe down, and then just drop the vapor path and mouthpiece in some iso for about 10 minutes, give them a quick wipe, rinse and let them dry before putting them unit back together. The included pipe cleaners work great for cleaning the vapor path quickly. If you are not time limited, you can just drop the mouthpiece, and vapor path into ISO overnight and you won’t even need to use the pipe cleaner. Other than the size, I feel like the pearl is the most improved upon feature with the new Davinci Miqro. The pearl actually works well and can shrink chamber size by around half for single person sessions. I also like to start a session with the pearl in one spot, and then when the bowl is at the very end I can give it a quick stir, and then extend the pearl to get the very last little bits out of the bowl. 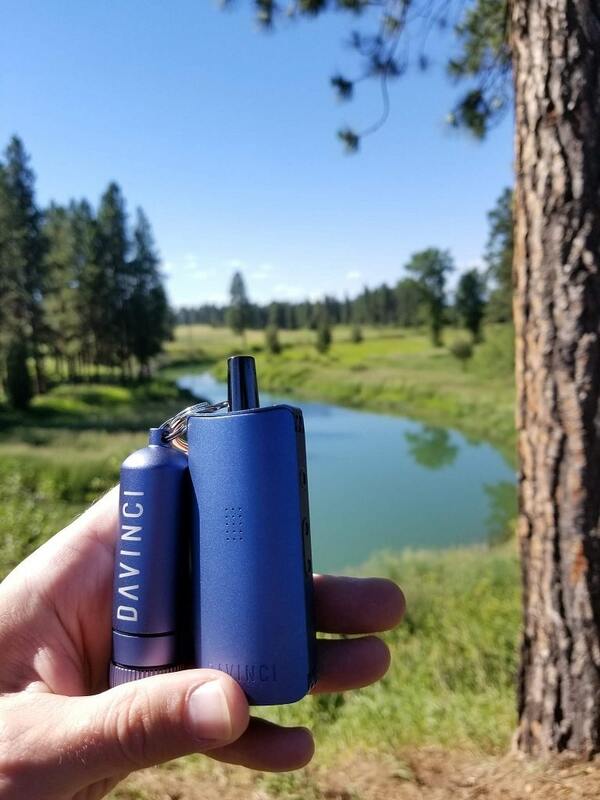 Davinci IQ – While I really like the IQ because of all the features that it offers, I’ve always been a fan of small vaporizers. I use them a lot in the outdoors, and usually, the smaller the pocket they can fit in, the better. The Miqro offers all the same features heating wise except the ability to customize smart paths. The only big differences between the two are battery life and I feel like the heater is either stronger on the IQ, or it gets more juice from the battery. 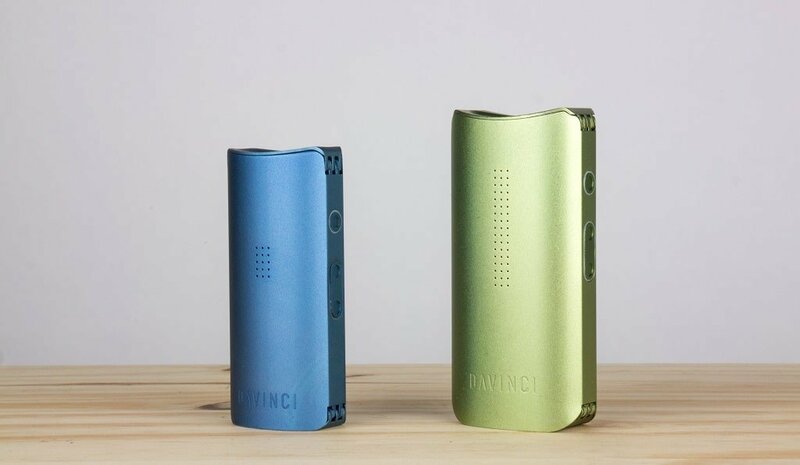 The Davinci IQ offers about 60-80 minutes of average battery life per battery. Between the two, the Miqro is easier to clean, maintain and the pearl actually functions how it was designed. You can shrink the chamber size roughly 50% making it perfect for single person sessions, whereas you need to buy the spacers to adjust the bowl size in the IQ. Overall the Miqro is another great addition to newly released portable vaporizers this year. Portable vaporizers seem to continue to get cheaper and better as time goes on. The sub 200 price point is blowing up and I feel like manufacturers are really starting to focus on making quality vaporizers at this price point. The Miqro is the smallest battery powered vaporizer to hit the market yet and still comes loaded with features. Basically everything you could want in a portable vaporizer and I can’t really complain too much about the battery life when it’s this small. Again, this is not the vaporizer for someone who will be using it all day every day. I would go for the IQ if that’s how you’ll be using it. This is the perfect dry herb vaporizer for someone heading to a friend’s house for a bit, going out for the night or hitting up a concert. With two full batteries, you can expect about 60 minutes of use depending on how you’re using the device and how much dry herb you’re loading for each session. If you’re cool with the battery life and looking for something super portable, look no further than the Miqro. You can pick one up directly from Davinci here. Be sure to use code “WIZARD” for 10% off all your accessories when they release the Miqro. Thanks for checking out my Davinci Miqro vaporizer review and let me know If you have any questions below or hit me up on my contact page. Have a great day! Slightly better vapor quality with the Miqro and the Miqro vaporizer offers much less draw resistance. You also don’t have purchase anything extra because the pearl reduces chamber size. You will get about 30 more minutes of battery life with the Pax 2 but not replaceable. Personally, I think the Miqro is perfect for micro-dosing and will be easier to clean/maintain than the Pax 2. I like them both but the Miqro is my go to right now. is there still rubber between the chamber and the vaporpath? Better taste with the ArGo but I think the Miqro is easier to clean. Both devices are about the same size, use replaceable batteries and feature a full temp spectrum. I’m not a huge fan of the screens with the stem on the ArGo so I think my pick would be the Miqro. The Miqro also has less draw resistance meaning that it’s easier to draw from. I plan to buy the Davinci Miqro when it is released next week. I wish it came with a USB wall adapter. Do you think Its a good idea to use the wall adapter I use for my iPhone or iPad to charge it? Also, is it best to buy directly from Davinci? I see a lot of folks are going with authorized online retailers to buy their Vape’s. I hope that the Miqro is still working out well for you, on your summer adventures. Hey Shawn, you are definitely safe to use the Miqro with your iPhone/iPad adapter, or any computer’s USB port. The worst thing that will happen if your charger/port is old is that it will charge slower. You can buy units like the Davinci Miqro from other authorized dealers, however if you buy directly from the manufacturer, and ever have any warranty issues they can often be streamlined. my question is similar to Shawn’s. I’m wondering wether to get the MIQRO or the PAX 3 with the half oven lid. The main purpose would be using it on the go just like you described it above: nights out, in the park, walking the dog. What I’m looking for is something I can put in my pocket easily just like these two. Pax 3 is a little slimmer but the Miqro is smaller overall. Much better battery life per full charge with the Pax 3 but I prefer the vapor quality and free-flowing aspect of the Miqro. You can also change the temps directly on the device of the Miqro. You get a full temp spectrum with both devices but can only change the Pax 3 via the app. How do you deal with the tiny herb particles that go through and make their way to your mouth / throat ? I generally like to use a medium grind, I find that when I grind the herb too finely I get more of the herb particles going through. I also notice that I get some particles when the vape is freshly cleaned, but even after a single bowl once the vapor path and mouthpiece have a slightly sticky coating the herb particles will hang up along the way before making it to your mouth. This is great idea Rachel. I’ll try this solution. I’ve been using a very dey herb (and probably old too) and I keep breathing these annoying particules. in your video you used a mouth piece of some sort whats is that called and when can I find it? It’s the Nectar Collector Honeybird combo. Check it out at Davinci here.